When my four year old son Marc is presented with a food he doesn’t like he says, “that’s not my favourite”. Well, cauliflower wasn’t my favourite either for a good part of my life. Then as with other foods that I didn’t eat until well into adulthood, something weird happened, I suddenly started eating them. For example, hard to believe I know, I once loathed coffee and hated prawns. Then in my late twenties I had a boyfriend who insisted I try both and I realized I really liked them (and him not so much). The boyfriend got the boot a long time ago but I passionately love coffee and prawns to this day. Cauliflower however, is one of those vegetables I can take or leave as I’m not a fan of any veggie with sulphur-undertones unless there is another more dominant flavour to cover them up. 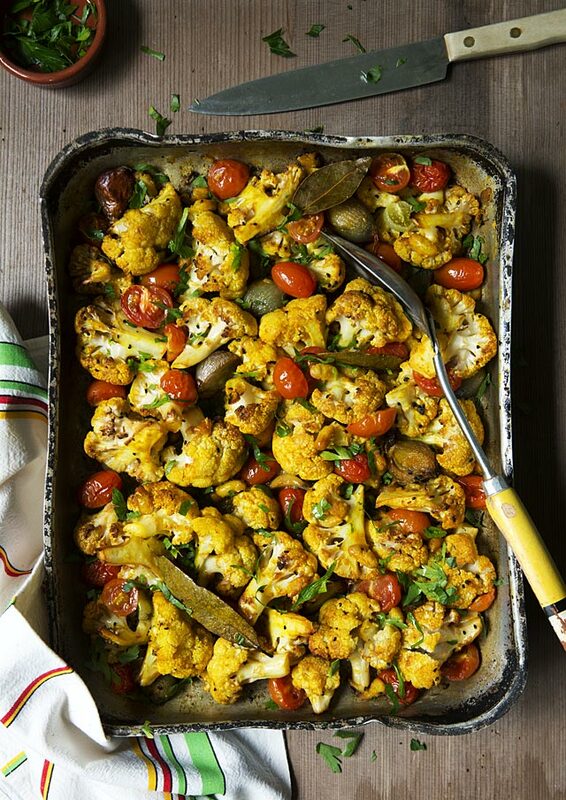 So a few weeks ago in an effort to make cauliflower dare I say it, exciting, I wrote this Autumn-inspired recipe when I saw them on special at our local greengrocer. (I’m a bit of an on-demand recipe writer, it’s a creative process and I find it very satisfying to use up a glut of produce.) This particular dish is slow-roasted for at least one hour which caramelises the cauliflower and eschallots, softens the juicy cherry tomatoes and gives the cannellini beans a wonderful nutty flavour. The cooking time also gives the cauli plenty of time to become infused with the spices and the glorious colours. This aromatic dish is warming, full of flavour, nutritious and makes a wonderful side or a great meal teamed up with some brown rice or quinoa and a dollop of plain yoghurt. It is also very easy to prepare and looks beautiful brought to the table. Please note that the spices I’ve chosen are vital to its success so make sure you use all the ingredients I’ve listed. They are available at the supermarket though I usually find nigella seeds at the local continental deli. So off you go, throw this recipe together and raise a glass to exciting cauliflower because now we know it really does exist. And as far as I’m concerned, that’s something worth celebrating. Prep time 20 minutes, cooking time 60-75 minutes. Serves 6 as a side or four as a main meal. I wanted rustic appeal for this image and the majority of the props to be monotone because the food has such intense colours. The background surface is a old door that I picked it up off the side of the road. The banged up baking dish and the vintage spoon were also found in hard rubbish. The little terracotta dish and knife are from local op shops and the vintage French tea towel is from a seller on Etsy. The only light used was daylight. Wow you really did an amazing number on this cauliflower! Lovely. This was a really good dish. Thanks for sharing! Really good. Kids, ages 7,9 and 18 mos. were picking the vegetables off the pan and gobbling them up. Added some broccoli too as my husband doesn’t like cauliflower. Thanks for a great recipe and beautiful pictures. Merci pour ce régal, chez moi aujourd’hui. Bonne journée.